Light, it’s all around you. Your eyes are constantly adjusting to it. But, when they struggle to keep up your eyes are forced to compensate. This can result in discomfort. Whether you are driving at night, or sitting at your desk, light is something we simply cannot escape. In fact, bothersome light is not only common in our day-to-day lives it’s also unavoidable. Sources of light such as sunlight, florescent light and incandescent light all can cause discomfort, along with a need to squint. Whether you are outside in the sunlight or at your computer, you may not even realize you are squinting. Sensitivity to changing light can be bothersome to your eyes and vision. But what if there was a way for your eyes to automatically adapt to changing light? Now there is! Transition contact lenses seamlessly adjust from clear to dark and back in response to changing light conditions. Transition contact lenses seamlessly adjust from clear to dark and back in response to changing light conditions. Squinting is an instinctive reaction by our eyes to bright light. This happens when light from other sources such as sunlight start to compete with light from everything else in your field of vision. All that extra light creates noise. And, like static, it obscures your vision. When you squint, you reduce the amount of light coming from other sources. As a result, you are stripping some of the noise away by helping your eyes block unfocused light. As crazy as it sounds, it’s a proven fact that squinting helps you focus better. By squinting, we reduce the light’s impact on our retina, thereby making what ever we are looking at, clear. But the problem with squinting is that is can cause eyestrain, or even headaches. Squinting is an instinctive reaction by our eyes to bright light. In the real world, we are exposed to a variety of lighting conditions. Although sunlight is the most disruptive to our eyes and visual function, lighting can alter how well we see. That’s because, the indirect effect of lighting has an impact on our physiological responses as well as our visual perception. Therefore, the amount of light coming into our eyes is critical to our level of comfort whether indoors or outdoors. Sometimes we forget just how much our eyes work each day to adjust to challenging environments. From playing sports to working under uncomfortable lighting, now there is a new contact lens that goes beyond vision correction by reducing exposure to bright light both indoors and outdoors. Picture this; you pop in your contact lenses just before you go outside on a sunny day for a bike ride. You don’t immediately squint because your contact lenses have automatically darkened to filter out the bright light. Thus keeping your eyes comfortable and your vision crisp. 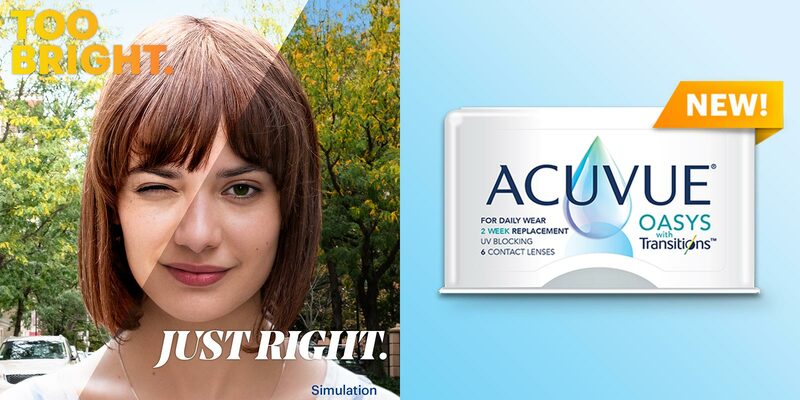 These self-tinting contact lenses known today, as transition contact lenses are FDA approved and the first to incorporate an additive that automatically darkens the lens when exposed to bright light. In bright sunlight, transition contact lenses darken, and when exposed to normal or dark lighting conditions, they return to a normal tint. These contact lenses, which will be available at Murata Eyecare as of April 1st, are intended for daily wear up to 14 days. However, it should be noted that transition contact lenses should not be a substitute for UV protective eyewear. That’s because while the lens covers most of the eye, there are still portions of the eye the need to be protected. 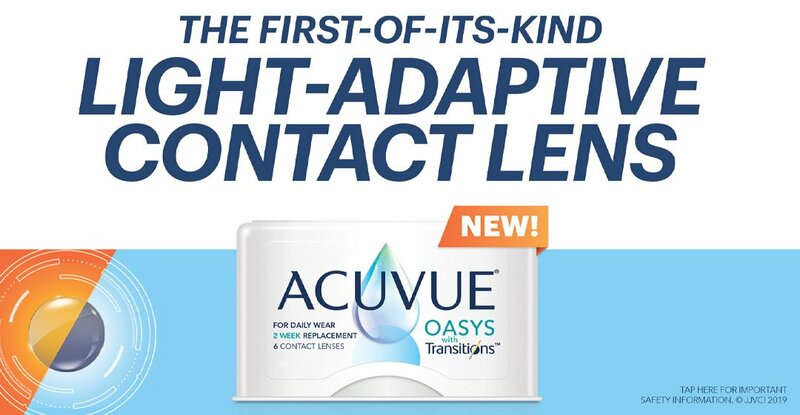 So far, transitions have only been available in eyeglasses, but as of April 1st, Murata Eyecare will be offering transition contacts lenses as a part of their contact lens offerings. For those who are interested in transition contact lenses the best place to start is booking a contact lens exam. That’s because a routine eye exam is not the same as a contact lens exam. During a contact lens exam, additional tests are needed for a proper contact lens fitting. Contact lenses are a great alternative to wearing eyeglasses. Since contact lenses come in many different designs, as specialists we will create a custom design that offers the best combination of vision, comfort, and eye health. Contact us today at (805) 522-7007 to book a contact lens exam, or to learn more about the types of contacts we carry.